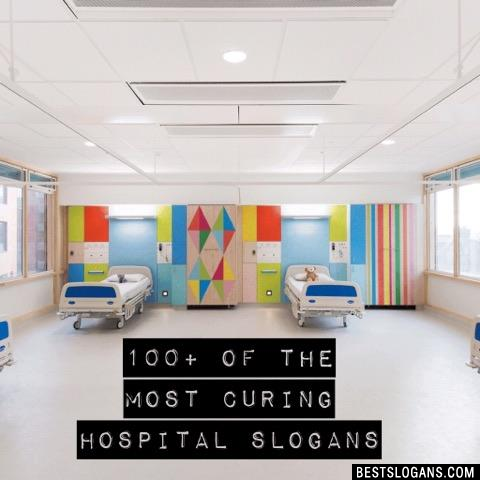 109 new entries added to hospital slogans, that include pictures. 1. Putting more care into healthcare. 1 Putting more care into healthcare. 3 For a better tomorrow and a brighter future! 4 Not only caring about you... We care about Our World. 5 Always Caring. Always Here. 6 Family friendly. First class. 7 My Community. My Hospital. 8 Healing experiences- for everyone. 9 Efficiency is our priority for you. 10 Every life, every moment, every day. 11 Just for the Health of It. 12 A Legacy of Excellence. 13 A commitment to community. 14 Good neighbors. Good health. 15 Efficiency for our patients. 16 We see your future, so should You. 17 Fast. Friendly. Accurate. For all patients. 18 Our bottom line is you. 19 A leading light in healthcare. 20 Small enough to care. Large enough to heal. Can you think of a good Hospital Slogans we're missing? Or come up with a clever one of your own. Please share below.